The loss vs Cincy hurt. It hurt bad. Losing a game where you were up 3 scores on the road in the 2nd half, hurts. But one thing is for sure. The loss was NOT Tannehill’s fault. The defense played well, creating turnovers and keeping a potent Cincy offense & AJ Green in check for most of the game. They only allowed 1 TD, which came after a very suspect TJ McDonald pentalty that kept that scoring drive alive. The offense in the first half appeared to be making strides. They were moving the ball on the ground and in the air through the first & part of the second half, until that dreaded 4th quarter. Enter everyones favorite villain, Ryan Timothy Tannehill the 3rd. The vile being spewed towards Ryan Tannehill is expected after a loss like that. I am sure he feels worse than you & I combined. However, I am here to ask you to check your GM ego at the door and realize what happened in the 4th quarter yesterday was a combination of horrible pass protection & BAD LUCK that not even your favorite QB (not named Ryan Tannehill of course) could have avoided. Once Laremy Tunsil was removed from the game due to a concussion, RT17 was running for his life every time he stepped back to pass. On the “pick 6”, he had to throw the ball away given the second he turned to pass he had a defender in his face and the pass ricoched off of Durham Smythe’s facemask backwards almost 10 yards right into the arms of Michael Johnson. That ridiculous bounce was Ryan Tannehill’s fault? What happens if that just falls incomplete like all the other times a QB dumps the ball to kill a play? Not as bad, but the “strip sack” returned for a TD, also the result of zero time. He wasn’t sitting back in the pocket and a Bengal just stripped him. He was running for his life and at the last second the ball gets knocked out of his hand, right into another Bengals player already running into the endzone. Again, lets jut say Tannehill wasn’t carrying a lucky four leaf clover in his uniform in the 4th quarter. If these two TD’s were the result of passes in the pocket where he misfired and/or couldn’t feel the rush coming, I would be pouring gasoline on this fire as well. I do not feel that to be the case here, and hope everyone can use more perspective when evaluating the final quarter. 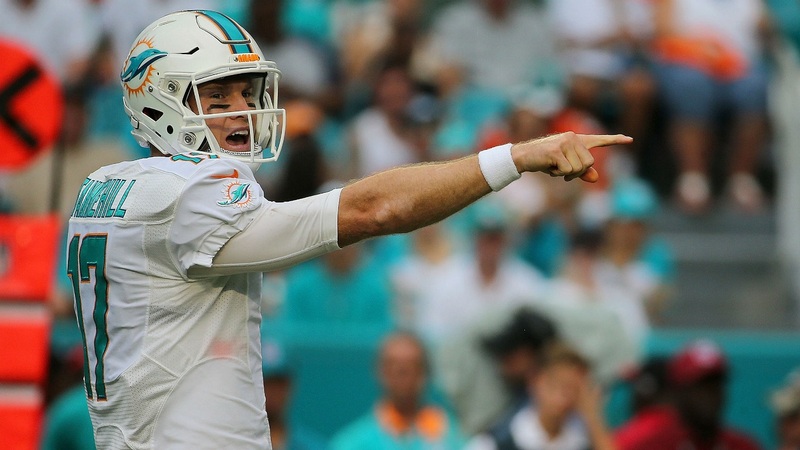 Ryan Tannehill is not Tom Brady or Aaron Rodgers, he never will be. He is not an elite QB that will put a team on his shoulders and be in the running for MVP. Only a couple teams have those, so don’t feel like you are in the minority here. However, he has proven to be a solid QB under Gase with respectable stats (when he isnt running for his life). You think his TD/INT stats are garbage, then maybe you like the stat that he has won 10 of his last 13 starts under Gase? He is a respectable QB and not someone a fan base should be referring to as Tannekill. I’d argue with proper protection under Gase, he has looked more like Tannethrill. No matter which side of the fence you fall on here, just know Marino isn’t walking through those doors and Tannehill is your QB for at least 2018.